Faux Taxidermy White Antelope Head - Large White and Gold Resin Gazelle Faux Taxidermy Home Decor. The African gazelle / antelope is a beautiful and graceful animal known for its long slightly curved horns. This stunning large faux white antelope head has been realistically designed to mirror the beauty of these African safari animals. Show off your love for animals by displaying this beautifully crafted and detailed resin gazelle head, which of course is cruelty-free. Our faux taxidermied animal heads are modern, trendy, and animal-friendly. 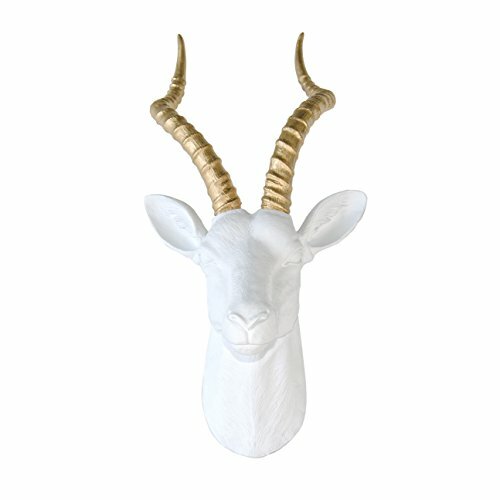 Our fake white resin gazelle head has been custom painted white with gold horns. Have a different color in mind? We can customize any of our faux taxidermy pieces ANY color. Instead of having a color chart that can limit your creativity, we can work with absolutely any color. Just message us with a general color you have in mind or even an exact shade, and we will create your Near and Deer piece with the exact custom color of your choice. Each piece is custom made to order, so please allow 2-4 business days for production. If you need the item sooner, message us and we will try our best to accommodate your needs. MEASUREMENTS: - 23" tall including the horns- 11" wide- 9" deep. WEIGHT: - 6 lbs. HANGING INSTRUCTIONS:- The antelope's horns are removable for easy shipping and storage. Before hanging, place the horns in the holes in the antelope's head and glue into place. Gluing the horns is not required, but recommended to decrease the likelihood of someone bumping into the piece and breaking the horns. - Hang the antelope head on a strong screw. We recommend hanging it on the stud of the wall or using a drywall anchor if you are not mounting it to the stud. CUSTOMER SERVICE: Shop with confidence with Near and Deer. We work full-time on our shop to ensure that our faux taxidermy products are completed as quickly as possible with the highest possible quality. Our customer service is superior. If you have any questions about this product by Near & Deer, contact us by completing and submitting the form below. If you are looking for a specif part number, please include it with your message.